Only two weeks ago, research firm IDC published a press release where they predicted that Microsoft’s Kinect would heavily outsell Sony’s PlayStation Move; this prediction has, sort of, come true in the form of VGChartz recently published sales figures. With ten days of release in the Americas and four days of release across Europe, VGChartz estimates that around 1.3 million Kinect sensors have now been sold-through to consumers worldwide representing around $250m in worldwide revenue. Breaking this down by region – 950,000 Kinect sensors have been sold in the Americas, 130,000 in the UK and around 200,000 across the rest of Europe. This is in accordance to IDC’s earlier prediction. 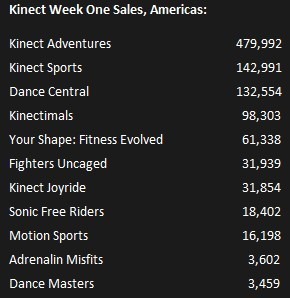 In the first week, Kinect sold almost 480,000 units whereas Move only managed 200,000 in America. UPDATE: Microsoft has just confirmed that they have sold over 1 Million KINECT for Xbox 360 units in first 10 days since launch. Early customer demand for controller-free entertainment solidifies biggest year in Xbox history. "We are appreciative of the response we have seen from consumers that has culminated in sales of more than 1 million units in the first 10 days on the market for Kinect for Xbox 360," said Don Mattrick, president of the Interactive Entertainment Business at Microsoft. "This is a great start to the holiday season, and we will continue to work with our retailer partners to keep pace with high demand and deliver against our plan to sell more than 5 million Kinect sensors worldwide by the end of this year." Before the Kinect launch, Microsoft raised its worldwide sales forecast from 3 million to 5 million sensors sold by year-end. 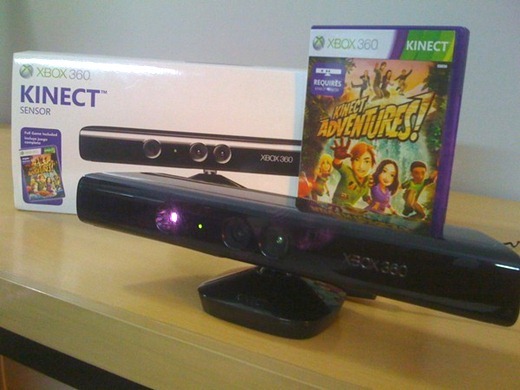 Kinect launched in North America on Nov. 4, followed by Europe on Nov. 10, and will land next in Asia (Nov. 18) and Japan (Nov. 20). By this holiday, controller-free games and entertainment will reach more than 60,000 retailers in 38 countries with up to 17 Kinect games available. "We have seen tremendous excitement from customers for Kinect for Xbox 360," said Chris Homeister, senior vice president and general manager of the home entertainment group at Best Buy. "There were lines of customers at our stores all over the country on the night of the Kinect launch, and thousands more are trying it for themselves in our stores every day. It’s no surprise Microsoft has already surpassed 1 million units sold, and we expect Kinect to be one of the must-have gifts at Best Buy this holiday." Microsoft also recently announced that the more than 25 million Xbox LIVE members have spent more than 1 billion hours on the service a month, an average of over 40 hours per member. In addition to Xbox 360 console momentum, and the ever-expanding service and content library of Xbox LIVE, Microsoft released franchise games such as "Halo: Reach" and "Fable III" to hordes of devoted fans this fall, as well as announcing that Xbox 360 will be the first console to launch add-on content for all "Call of Duty" titles through 2012, helping drive industry software sales. With Xbox 360, Kinect and Xbox LIVE, Microsoft is proving to be a leading gaming and social entertainment service in the living room and the industry this holiday. • Xbox 360 4GB console with Kinect. For new Xbox consumers, the Xbox 360 4GB console with Kinect, priced at $299.99 ERP (U.S.), includes the new flat black Xbox 360 4GB console, Kinect sensor and "Kinect Adventures," which will have families off the couch and enjoying entertainment quickly and easily. • Xbox 360 250GB console with Kinect. For the serious entertainment experts in the family, the Xbox 360 250GB console with Kinect, priced at $399.99 ERP (U.S.), includes the glossy black Xbox 360 250GB console, Kinect sensor and "Kinect Adventures" and provides more memory to store movies, music and more. More information on Xbox 360 and Kinect for Xbox 360 is available at http://www.xbox.com/Kinect or https://www.facebook.com/xbox. Xbox 360 is a premier home entertainment and video game system. This November, with the addition of Kinect, Xbox 360 will forever transform social gaming and entertainment with a whole new way to play – no controller required. Xbox 360 is also home to the best and broadest games as well as the largest on-demand library of music, standard- and high-definition movies, TV shows and digital games, all in one place. The entertainment center of the living room, Xbox 360 blends unbeatable content with a network of 25 million Xbox LIVE members to create a limitless entertainment experience that can be shared at home or across the globe. More information about Xbox 360 can be found online at http://www.xbox.com.